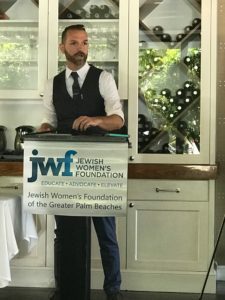 JWF Men as Allies: Why Feminism is Good for Men will examine one of JWF’s core beliefs – that when women and girls are supported and empowered, the entire community benefits – men and boys included. Jeffrey Nall, Ph.D., an author, speaker and interdisciplinary scholar, who is currently a Master Instructor of Philosophy at Indian River State College where he teaches courses in philosophy and humanities, will lead the discussion. Nall plans to focus on how societal norms limit the ability of men and women to be safe and reach their full potential.